The question of whether or not children should share a bedroom is constant but is it encouraging a battleground? Should siblings share a bedroom? Does it make them closer or is it a potential battleground? Should siblings share a bedroom? Does it make them closer or is it a potential battleground? In my experience it is definitely the former. My new book, The Secrets Sisters Keep, is surprisingly enough, about sisters! I think the bond with a sister is like no other. If you are lucky enough to have a sister, who you get on with, you'll know what I'm talking about. And if you shared a bedroom with your sister growing up, you'll understand that special bond. I have one sister, three years older than me, who I am very close to. We shared a bedroom and talked long into the night about everything. So when she left home and went to live in Sydney for a year, I was bereft. This is long before mobile phones, e-mail and Skype. When my father got the phone bill that Christmas, he hit the roof. If I remember correctly he said - via gritted teeth and a clenched jaw - that I could have flown to Australia, had a long face-to-face conversation with my sister and flown home again and it still would have cost less than the phone bill. I firmly believe that part of the reason we are so close is because we shared a bedroom. 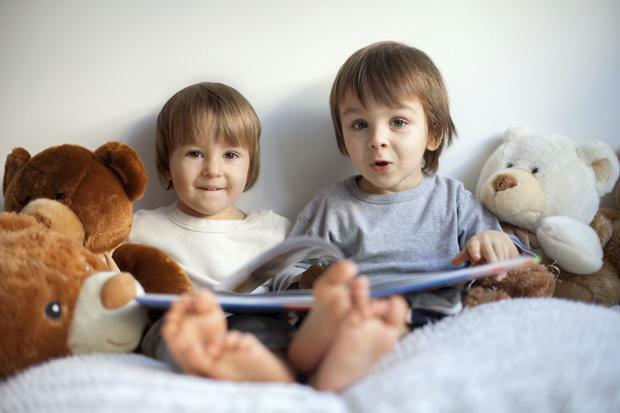 Sharing a small and confined space with your sibling will make or break your relationship. Of course you won't agree on everything. You will argue and bicker over numerous issues. However, from a very early age you will learn to compromise, share and work out privacy and space issues. All of these are tools that will serve you well later on in life when you share a flat with friends or an office with colleagues or a house with your partner. In my experience, by the far the best housemates were the ones who came from big families and were used to sharing and helping around the house. This sharing of space and becoming close is not unique to girls. The same applies to boys. Brothers who share a bedroom will also experience a closeness they might otherwise have missed. In fact, I think it's probably even more important for boys to share a bedroom as young boys can often be quite closed about their feelings. Boys tend to internalize a lot and can be less expressive than girls. They need a fellow male to talk to and ask advice of. I put my two boys in a bedroom together from day one and they love their bunk beds and their little conversations at night. When I suggested splitting them up next year they both looked horrified and begged me not to. They love being together and I can see how close they are because of it. Sadly, sharing bedrooms is becoming less common as families sizes are shrinking and houses are getting bigger. Parents are taking advantage of the space to be able to give each child a room of their own. They feel it's important to give a child privacy and personal space. Some parents feel they are selling their kids short if they make them share a bedroom. Our society promotes a "me, myself and I" mentality, where we are encouraged to put ourselves first. While this can be important in achieving goals it's also important to remember that you will most likely end up sharing a living space with someone else at some point and that their needs matter too. Sharing a bedroom is therefore an excellent preparation for the compromises that your child will need to make in their future life. Starting early seems like a good idea. Children who have learned to sacrifice and work together on decisions and be considerate during childhood are gaining wonderful real-world skills that will serve them well throughout their lives. My daughter often complains that she has to sleep by herself and wants to move in with her brothers. I'm seriously considering it. The more the merrier, in my opinion. While it would be a tight squeeze to fit another bed into the room, I think they'd have a ball together. Sharing a room isn't the end of the world. It may be one of the best decisions you ever make for your children. I certainly benefited from sharing a room with my sister and we remain very close to this day. She, like me, has put her children in a bedroom together. We are both hoping that our children will be as close as we are.